These clear acrylic poker chip trays will hold 100 poker chips. These trays make for easy handling, organization and storage of your poker chips. Each row of the tray will hold 20 chips, making it easy for counting out chips. Full chip trays will stack one on top of the other for great storage. We highly recommend these trays for storage of your poker chips. 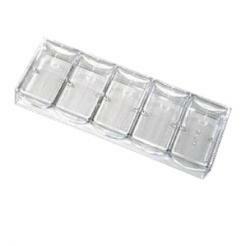 These trays are also used with the 1000 Chip Acrylic Chip Carrier. These poker chip trays are exactly the same tray that are used in casinos and card rooms around the world.